Your friends envy you when you tell them your doctor wants you to add pounds, but you may have already learned the hard truth: It’s trickier than it sounds. Especially if you want to do it the healthy way. “You can’t just throw high-calorie junk foods into your diet,” says Kim Larson, a dietitian in Seattle. You want to eat stuff with lots of calories, of course, but they’ve got to have nutrients, too. With a little patience, though, you can cross the finish line. Just don’t expect to reach your daily goal of calories right away. You’ll most likely have to build up to that slowly. Michael Basham, a retired professor and psychologist from Boulder, CO, discovered that firsthand. He’s trying to gain the 30 pounds he lost while he recovered from complications of back surgery. Larson says there’s nothing wrong with the go-slow approach. “Gradually, over a few weeks, we have to increase the amount of food that the gut is able to handle,” she says. Your first step to put on the pounds: Swap out the foods you already eat for higher-calorie versions. Get rid of anything that’s “fat free,” Larson says. Make your own salad dressing with healthy oils, rather than buying them ready-made. Bid farewell to products that have “light,” “diet” and “low-cal” on the label. Eat higher-calorie breads, and choose bagels over toast or English muffins. Also put fatty fish, like salmon, on your dinner menu. It’s higher in calories and has healthy omega-3 fatty acids. Eat desserts that have a lot of nutrients, like frozen yogurt, oatmeal cookies, zucchini bread, and pumpkin pie. Review your fridge and cabinet, and track your eating for a few days to see what else can be replaced with high-calorie options. “Being from Boulder, Colorado, one of the healthiest cities in America, it was hard to switch from sugar-free and fat-free products to sugar in my sweet tea and whole milk on my cereal,” Basham says. Though you may not take in the target number of daily calories at first, you should eat three meals a day and snack in between and after dinner, no matter what. Make sure that your snacks are small enough that you’ll be able to eat again at your next mealtime. Eat foods that pack a lot of calories — and nutrients of course — into a small space. Dietitians call these “calorie-dense.” That way you can get the calories you need without filling up too fast. Nuts. They’re high in fiber and protein and have about 150 to 200 calories per ounce. Seeds, such as sunflower and pumpkin, also cram a lot of calories into a few bites. They make a great snack. Sprinkle them on salads, oatmeal, soup, and anywhere else you can. Nut butters. A tablespoon of peanut butter has about 100 calories. You can also try a spread that’s made from almonds. Dried fruit. You can get 147 calories from an ounce of banana chips. Don’t forget raisins, prunes, craisins, dates, and figs, too. Snack on them and toss them into salads and cereal. Fresh, dense fruits. Some good choices are mangos and avocados. A medium-sized mango has 130 calories. Avocados can have more than 300 calories, depending on size and type. “I incorporated a lot of avocados and other healthy fats into my diet when I was trying to gain weight,” says Amber Dumler, a museum specialist in Washington, D.C. Already petite, she lost about 12 pounds when she was breastfeeding her first child. She struggled to put the weight back on and keep it on. Starchy vegetables. They’ve got more calories than other veggies. A cup of corn has 156 and a cup of peas has 117. A medium baked potato has 159. A large artichoke has 80. Healthy oils and fats. You can get 120 calories from a tablespoon of olive oil. “Adding healthy fats was a really easy way to add calories,” Dumler says. Wheat germ and flax meal. You can also mix these into other foods to give them added calories. Flax meal has 30 calories per tablespoon along with fiber and healthy omega-3 fatty acids. 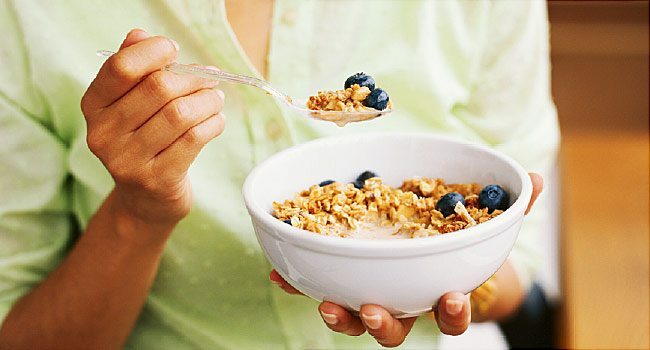 Wheat germ has 26 calories in a tablespoon and gives you important nutrients like fiber and folate. Trail mix. It’s a higher-calorie snack that brings together dried fruits, nuts, seeds, and any other goodies you want to add. Chocolate chips, anyone? If you don’t have much of an appetite for 100- to 200-calorie snacks between meals, try drinking your calories at snack time instead. Liquid can make you feel full, even if it’s a zero-calorie glass of water, so make every sip count. Replace water with fruit juice or something thicker if you can. “Go for rich, cream-based liquids as much as you can,” Farrell says. Smoothies are a chance to toss in all those calorie-dense fruits, nuts, and liquids. “Add whole milk or vanilla yogurt, if you can tolerate it. If you like it, use nut butters, avocado, or olive oil in your smoothie,” Farrell says. “I began drinking a homemade smoothie consisting of protein powder, milk, yogurt, a banana and a high-calorie supplement that my dietitian suggested,” Basham says. At meal times, on the other hand, try to limit how much liquid you take in so that you can save room for solid food. If soup’s on the menu, go for thick, creamy ones rather than clear broths. When it comes to adding pounds, you’ve got to be patient. You won’t see results overnight. Once you hit your stride, it won’t be too long before you hit the magic number on your scale.